Expanding our Ultimate Drive offer for ALL new BMW models. Starting June 30, 2012, we’ll be expanding our popular Ultimate Drive loyalty offer to all new 2012 and 2013 BMW models. You can earn up to $700 depending on model selected. 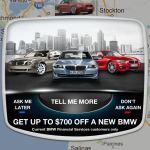 Check out www.ultimatedriveapp.com for more information. Offer ends September 30, 2012.